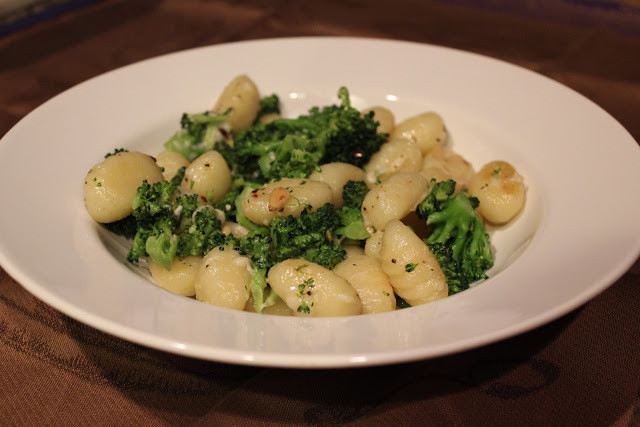 As you can guess, Matt was not home when I made this Meatless Monday dish of browned butter gnocchi with broccoli and pine nuts. I say that because I would consider this dish “fancy”, a word that Matt does not like to classify his food with. 🙂 Matt is from the country and hence, likes good ‘ole southern comfort meals with lots of meat!! I on the other hand, like trying new foods, especially ones with a touch of sophistication. While I hate mashed and baked potatoes, I LOVE gnocchi. 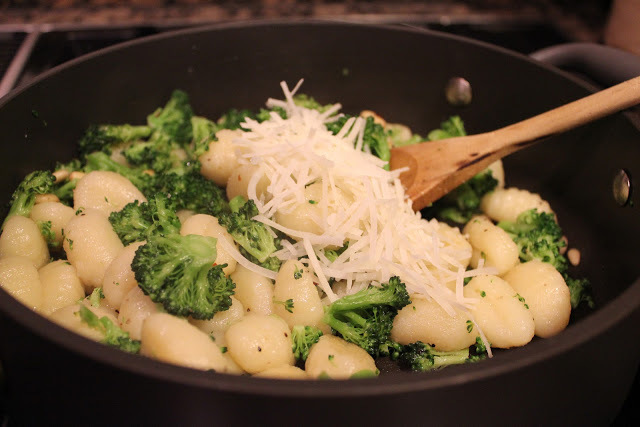 (The gnocchi I used actually contains potatoes!) 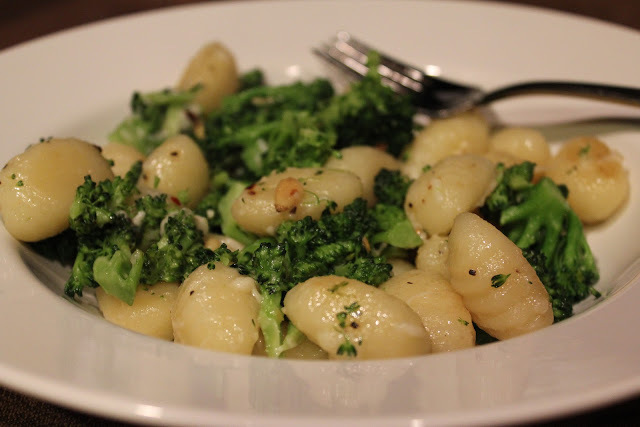 For those of you who don’t know, gnocchi is an Italian type of pasta, resembling thick, soft dumplings. 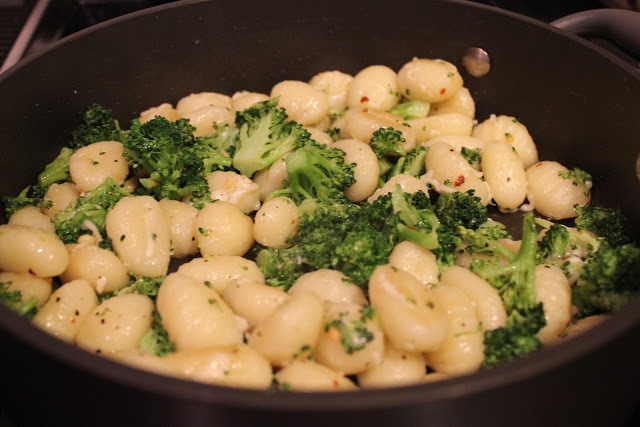 Gnocchi can be made from ricotta, flour and egg, potatoes, or other similar ingredients. 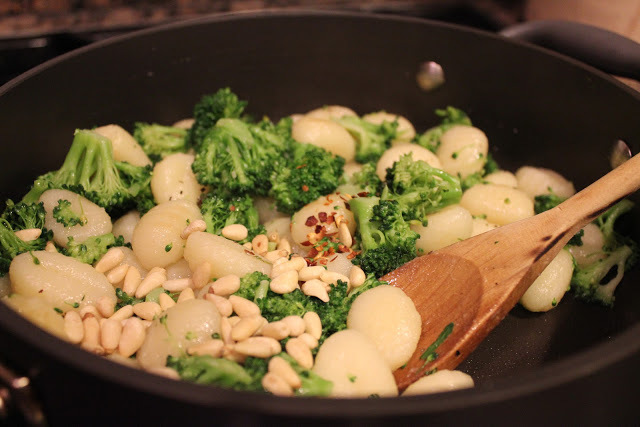 If you’re like me, you’ll really enjoy this dish with the chewy gnocchi, sweet broccoli and crunchy nuts. The red pepper flakes and pecorino Romano cheese add a nice flavor to the already lightened-up sauce. Enjoy! Cook gnocchi according to package directions. Add broccoli during last minute of cook time. Brown butter in large skillet. 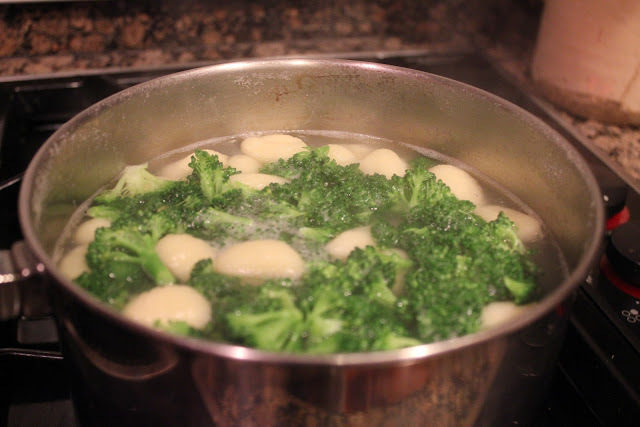 Add drained gnocchi and broccoli. Add freshly ground pepper, red pepper flakes and pine nuts. Off the heat and stir in Pecorino Romano cheese. Stir to combine and cheese melts. 1. Cook gnocchi in a large Dutch oven according to package directions. Add broccoli during last minute of cooking; cook 1 minute. Drain. 2. Heat large skillet over medium heat. Add butter and oil; cook 7 minutes or until butter browns. Add gnocchi mixture and pepper to pan; toss to coat. Turn off the heat and add pine nuts and Pecorino Romano cheese. 3. Spoon about 1 1/2 cups gnocchi mixture into each of 6 shallow bowls. Sprinkle with Parmesan cheese.